How do you judge an album that follows an undisputed masterpiece? Furthermore, how do you judge that album when it comes more than two decades after that masterpiece? That's the dilemma we have when approaching MBV, the new record from My Bloody Valentine, the long (there's an understatement) awaited follow-up to 1991's Loveless. The real genius behind Loveless was in the way the band twisted the harsh sounds of guitar feedback and reverb into a mesmerizing and immersing experience of utter beauty. 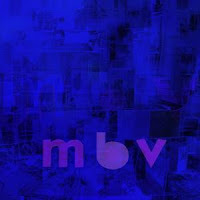 It's that combination which proves elusive to recapture much of the time on MBV. Instead, songs like "Who Sees You" are only harsh. Strangely given the time Kevin Shields had to tinkle, some tracks such as "She Found Now" are barely above demo-quality. Of course, that demo-quality far out-strips what any other band in the genre has accomplished over the past 20 years. There are some moments that come close to recapturing the glory. The swooning in and out of "If I Am" is reminiscent of the best of Loveless. The full-frontal assault of "In Another Way" is the most all-encompassing cut on the record. It puts you right inside the eye of the aural hurricane. The boundaries are pushed a little bit on "Is This And Yes". It's an organ sound that takes the lead. The song never quite ignites as one would hope, but the makings of something potentially great are present. A gripping bassline thumps away on "New You", a track on which you can also (*gasp*), make out what Belinda Butcher is singing. Any way you approach it, MBV is a slow-growing album. Each time I listen to it my opinion of it improves. Given that, the rating I give it now may be completely meaningless by the time year-end lists come around. Best tracks: "New You", "In Another Way"